Within living memory, the practice of segregation prevailed in the states of the former Confederacy (and sometimes even beyond them). That is, the phenotypical distinction between humans of African descent and those of European descent was judged to have moral and legal significance, and the “races” were kept apart from each other in various formal and informal ways. People may prefer to be around other people who “look like them,” but there is a big difference between doing something because you want to, and doing something because you have to. Furthermore, if there was any question about how resources were to be divided, those of European descent got the lion’s share, if not the whole thing. So starting with Brown vs. Board of Education (1954), which ruled that “separate but equal” was a contradiction, more and more laws were passed forbidding any racially exclusive membership policies of any public organization, or private business serving the public. It took some effort to overcome initial resistance, but by now the notion that segregation was morally illegitimate has been so thoroughly internalized that most white Americans don’t want to remember that it ever existed. This is progress, I suppose, but it is important to remember history, even that which makes us uncomfortable. Every now and then in my adopted hometown of Cartersville, Georgia, you get hints about the former dispensation: for instance, the train station, now the tourist office, has two waiting rooms where one should have sufficed. Last summer the kids really wanted to go swimming, but the Dellinger Park swimming pool, where we normally go, was closed. The Cartersville City website said that another facility, the Aubrey Street pool, was open, so we went there; that it was in the historically black Summer Hill neighborhood suggested to me that this was once the “black” pool for the city. Calling it an “absolute honor and privilege,” Alexis Carter-Callahan is delighted to help showcase the history of African-American businesses in the heart of Cartersville. 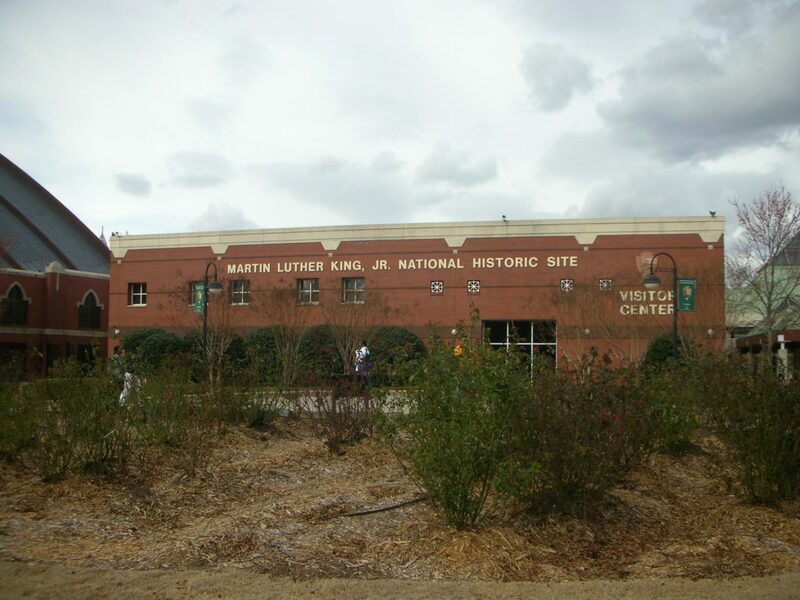 Titled the Walking Tour of African-American History in Downtown Cartersville: 1870-1940, the effort is a self-guided stroll highlighting eight sites and a pair of historic business districts. 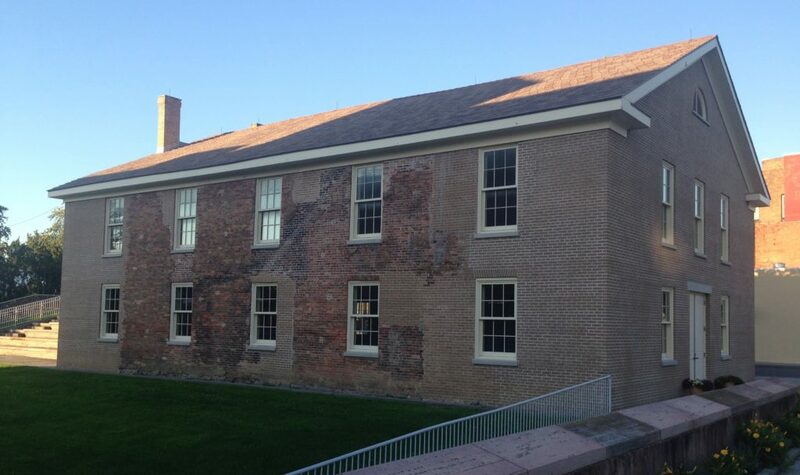 “I wanted to be a part of this project because my family has always had a strong tradition of sharing oral history,” said Carter-Callahan, who assisted the walking tour committee with its family history nights and setting up a Facebook page. “My elders have often shared stories of my great-great grandmother, Mary Eliza Young, who owned a restaurant in the [downtown Cartersville] West End district [in 1910]. A black, female entrepreneur who was one generation removed from slavery. Imagine that! To help with telling the story of other prominent black business owners and entrepreneurs in the community has been an absolute honor and privilege. To learn more about the walking tour and its historic African-American businesses, Cartersville Downtown Development Authority Director Lillie Read encourages individuals to attend a complimentary presentation Saturday from 11 a.m. to 1 p.m. at the Bartow History Museum, 4 E. Church St. Along with sharing the committee’s findings, the event will feature a guided tour, if time and weather conditions allow. Lloyd Lionel Gaines (1911, Water Valley, Mississippi – disappeared March 19, 1939, Chicago) was the plaintiff in Gaines v. Canada (1938), one of the most important court cases of the 1930s in the U.S. civil rights movement. After being denied admission to the University of Missouri School of Law because he was black, and refusing the university’s offer to pay for him to attend a neighboring state’s law school that had no racial restriction, Gaines filed suit against the university. The U.S. Supreme Court ultimately ruled in his favor, holding that the separate but equal doctrine required that Missouri either admit him or set up a separate law school for Black students. The Missouri General Assembly chose the latter option. It authorized conversion of a former cosmetology school in St. Louis to establish the Lincoln University School of Law, to which other, mostly black, students were admitted. The National Association for the Advancement of Colored People (NAACP), which had supported Gaines’s suit, planned to file another suit challenging the adequacy of the new law school. While waiting for classes to begin, Gaines traveled between St. Louis, Kansas City and Chicago looking for work. 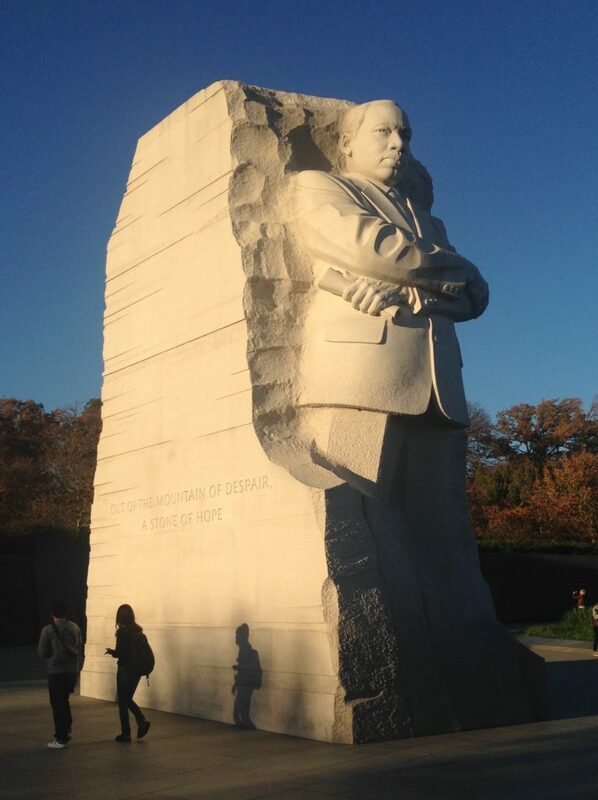 He performed odd jobs and gave speeches before local NAACP chapters. One night in Chicago he left the fraternity house, where he was staying, to buy stamps and never returned. Gaines’ disappearance was not noted immediately, since he was frequently traveling independently in this period, without telling anyone his plans. Only in the autumn of that year, when the NAACP’s lawyers were unable to locate him to take depositions for a rehearing in state court, did a serious search begin. It failed, and the suit was dismissed. While most of his family believed at the time that he had been killed in retaliation for his legal victory, there has been speculation that Gaines had tired of his role in the civil rights movement and went elsewhere, either New York or Mexico City, to start a new life. In 2007 the Federal Bureau of Investigation (FBI) agreed to look into the case, among many other missing persons cold cases related to the civil rights era. Despite his unknown fate, Gaines has been honored by the University of Missouri School of Law and the state. The Black Culture Center at the University of Missouri and a law scholarship at the law school are named for him and another black student initially denied admission. In 2006 Gaines was posthumously granted an honorary law degree. The state bar association granted him a posthumous law license. A portrait of Gaines hangs in the University of Missouri law school building. My general feeling about Confederate monuments remains the same: just leave them alone, and put up other monuments to current heroes as a riposte. It is just and fitting to celebrate the American Revolution, but one must also remember that, at the start, not everyone partook of its bounty equally. The tacit recognition of slavery is the original sin of the American republic; that women could not vote is now outrageous to us. Where was the “liberty” for these people? As the nineteenth century wore on, the movement to abolish slavery completely grew ever stronger, culminating in the passage of the Thirteenth Amendment in 1865. Women’s suffrage took longer – it was guaranteed on a national basis for all types of election with the passage of the Nineteenth Amendment in 1920, although many states had earlier granted the women the right to vote in other elections. It’s safe to say that the two biggest figures in these movements were Frederick Douglass and Susan B. Anthony. They both happen to be buried in the Mount Hope Cemetery in Rochester, New York. We made sure to visit their graves. 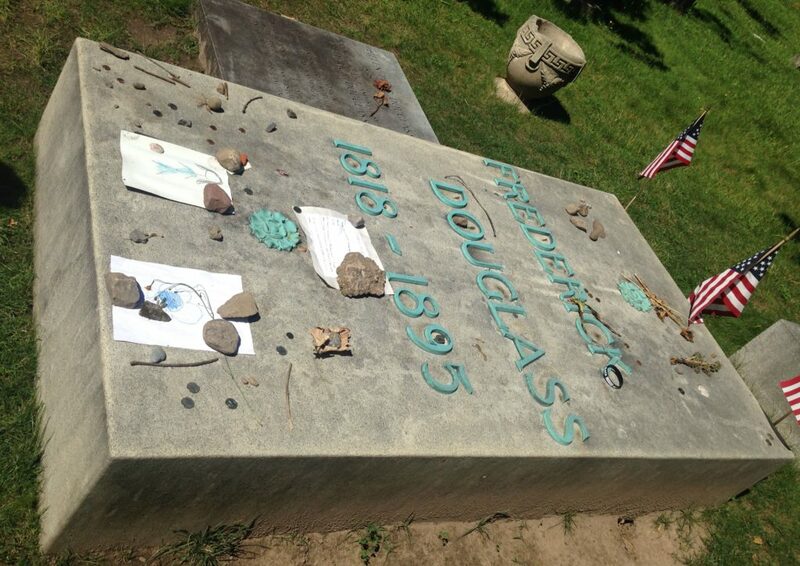 Frederick Douglass was born into slavery in Maryland in 1818 and escaped to New York at age 20. He became an anti-slavery activist and was known for his powerful oratory on the subject; his Narrative Life (1845) was a best seller which fueled the abolitionist cause and whose proceeds allowed Douglass to purchase his legal freedom. 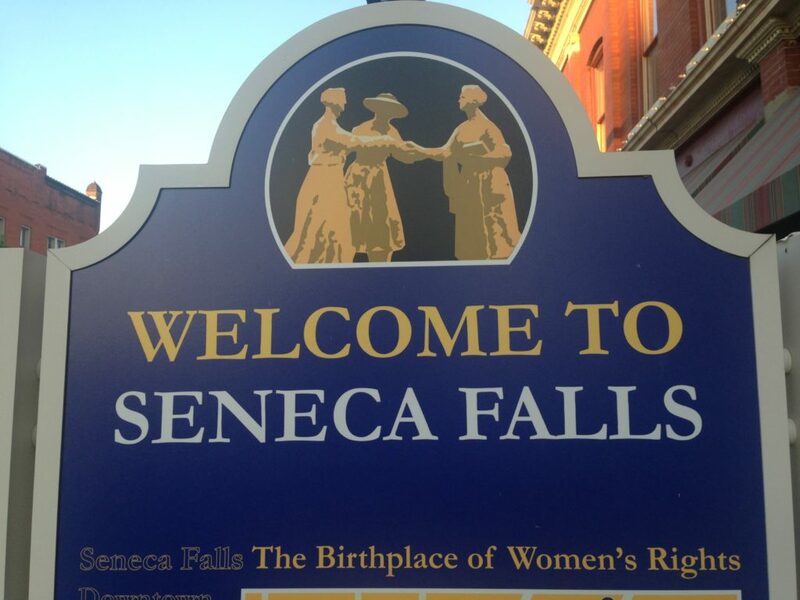 He was also the only African-American to attend the Seneca Falls Convention (1848), which launched the American Women’s Rights movement. 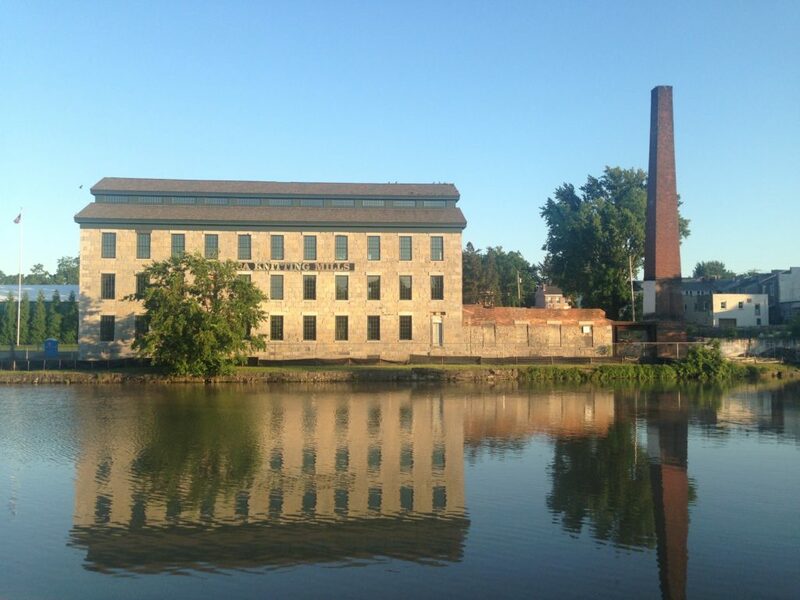 The town, located about fifty miles to the east of Rochester, seems quite proud of this heritage. 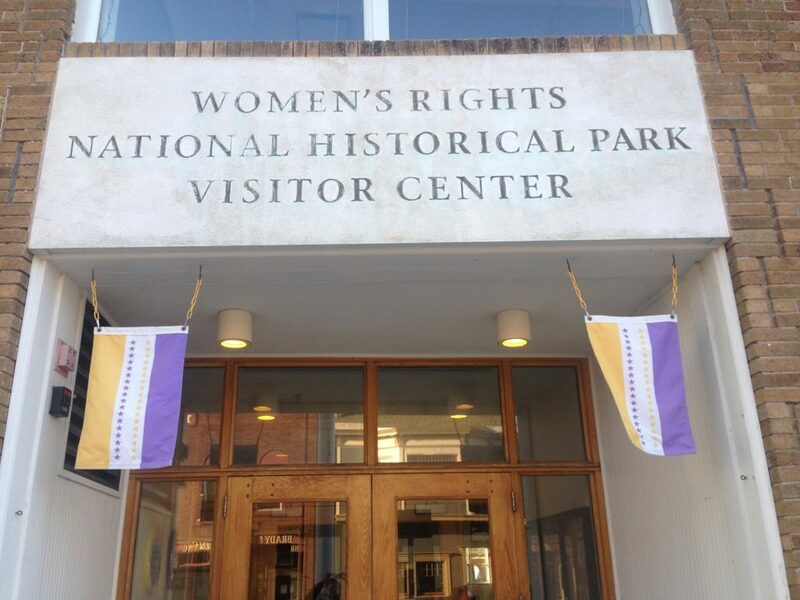 Unfortunately, the Visitor Center was closed when we got there, but I certainly appreciated the display of the Nineteenth Amendment Victory Flags. The (heavily restored) original venue. The Convention’s “Declaration of Sentiments” (a feminist twist on the Declaration of Independence) is inscribed on a wall on the other side of the greenspace in the foreground. 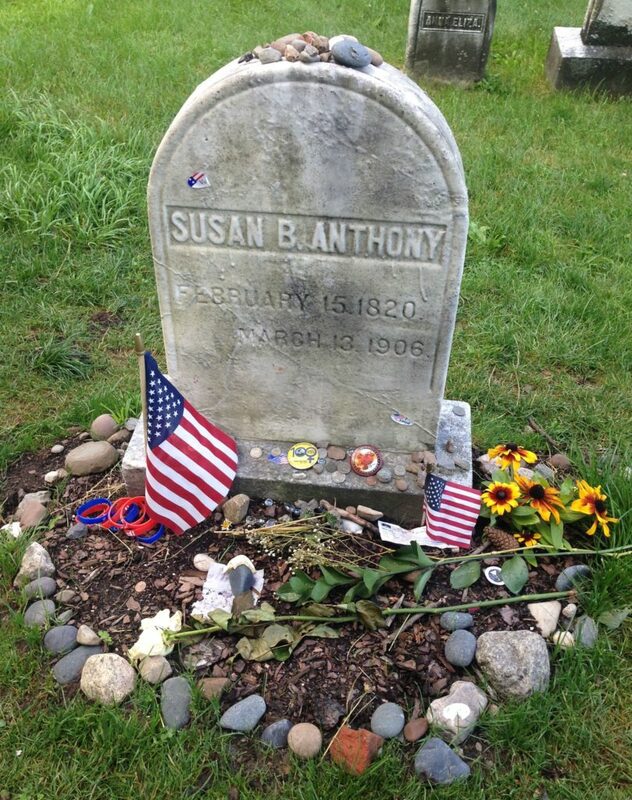 Susan B. Anthony was not actually at the Seneca Falls Convention, but with its main organizer Elizabeth Cady Stanton, whom she met in 1851, founded the Women’s Loyal National League (an abolitionist society) and in 1866 the American Equal Rights Association, which was dedicated to equal rights for men and women. Anthony, famously, was arrested for voting in Rochester in 1872, and refused to pay the fine; the authorities decided not to pursue the matter. In 1878, Anthony penned what was to become the Nineteenth Amendment, and up until her death she gave countless speeches in favor of the cause. Her grave in Mount Hope is a pilgrimage site of sorts for those who value a woman’s right to vote. 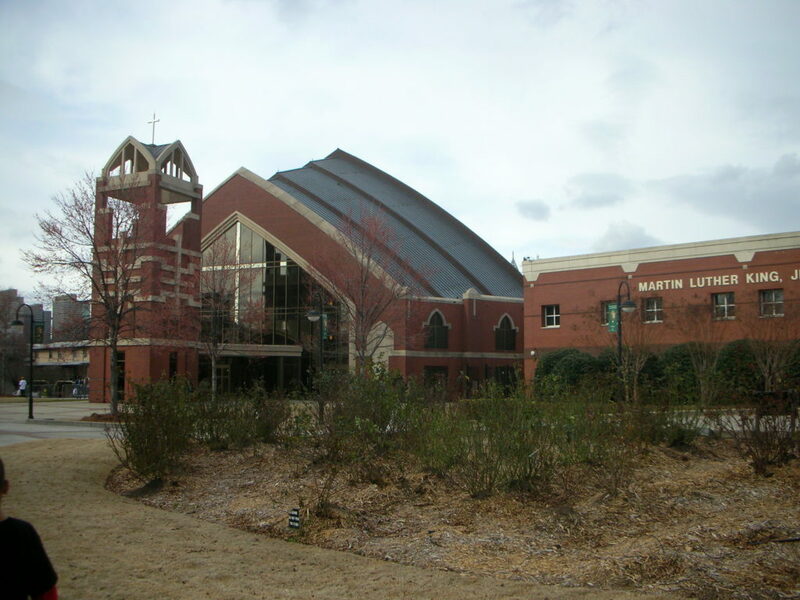 Here are some photos of the MLK National Historic Site in Atlanta, with Ebenezer Baptist Church (the third photo shows the sign on the historic Ebenezer Baptist Church located not far away). 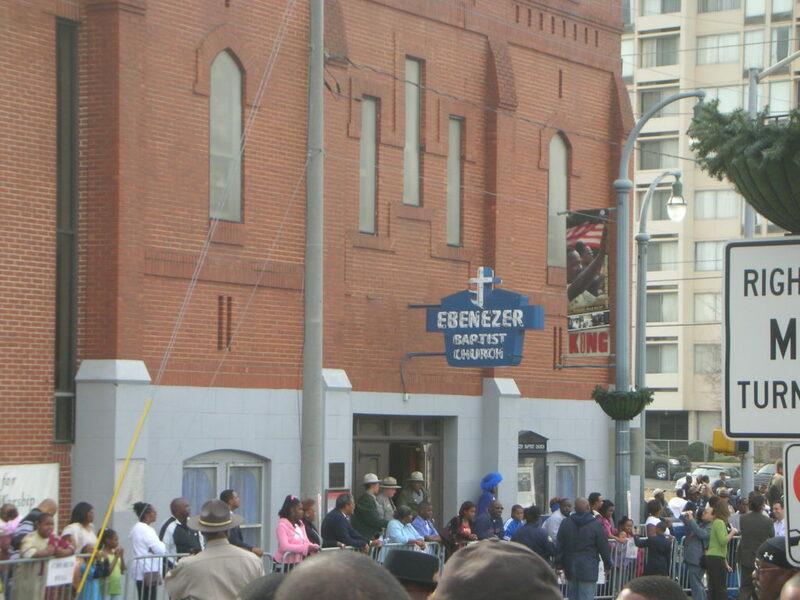 I took these on MLK Day ten years ago. The Museum, by the way, is wonderful. I was very lucky to get to see it. It is on the Mall near the Washington Monument; it opened in September and is hugely popular – so much so that you can only order tickets online, or so the security guard kindly explained to me when I asked about getting in. As chance would have it some people overheard my question and gave me an extra ticket that they had. 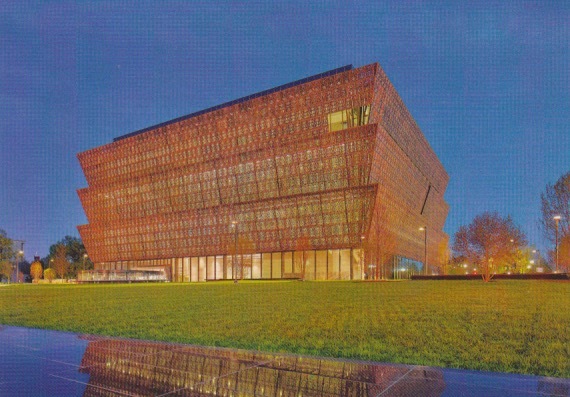 The building, by architects Philip Freelon, David Adjaye, and Davis Brody Bond, takes the form of an inverted bronze step pyramid and is meant to evoke a Yoruban crown. It provides the museum’s logo. Scanned from a postcard purchased in the gift store. The history galleries are in the basement; there was a long line for this so unfortunately I had to pass it by, even though history is what we’re all about here. Instead, I visited the top two floors, which contain the culture portion of the museum. 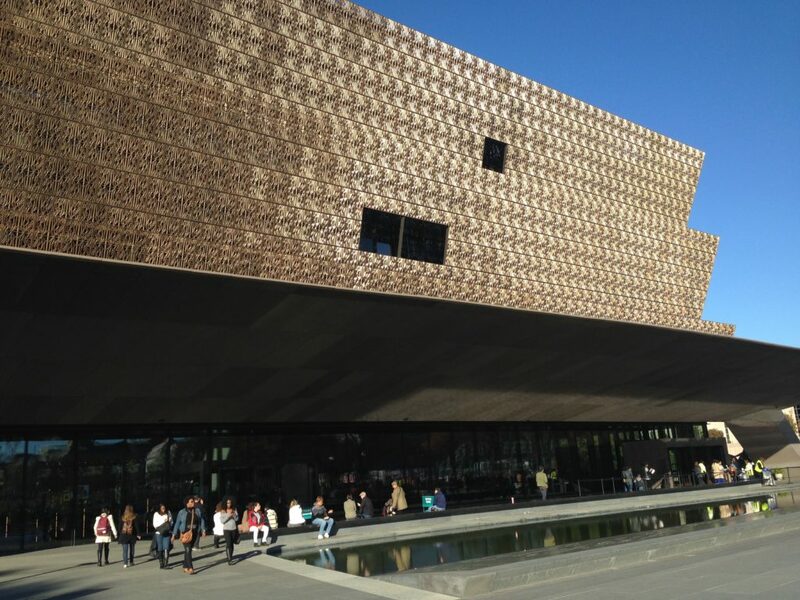 Extensive exhibits deal with African-American musicians, actors, athletes, artists, soldiers, and others, and African-American organizations like churches, newspapers, HBCUs, the Prince Hall Freemasons, and the National Pan-Hellenic Council. It’s enlightening, infuriating, and uplifting all at once, and I highly recommend it if you’re in DC. Just be sure to order your tickets ahead of time. 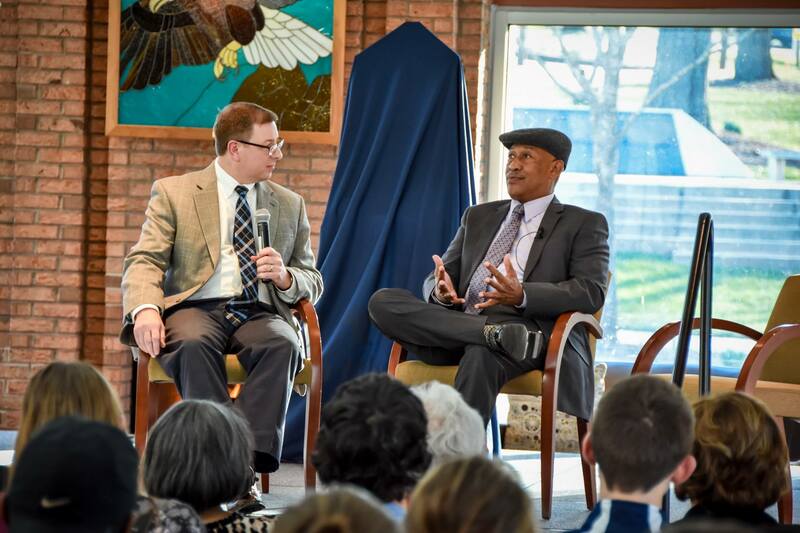 Photos (by Jeff Reed ’16) from last week’s Race and Reinhardt event, in celebration of the fiftieth anniversary of the integration of Reinhardt College by James T. Jordan ’68. Professor of history Kenneth Wheeler talks with Mr. Jordan in the Glass House. Dr. Wheeler, Mr. Jordan, and Dr. Edith Riehm, who gave a talk on the career of Civil Rights activist Dorothy Rogers Tilly 1899. 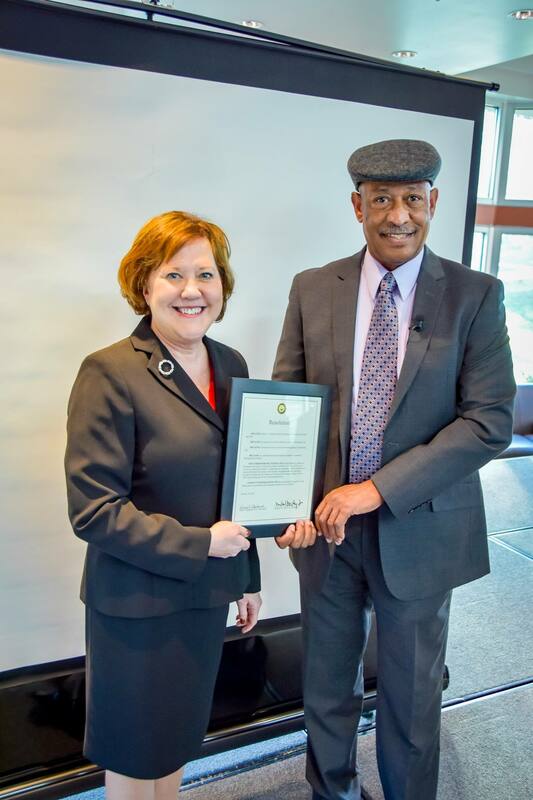 Reinhardt President Kina Mallard presents Mr. Jordan with a framed resolution from the Reinhardt board of trustees. 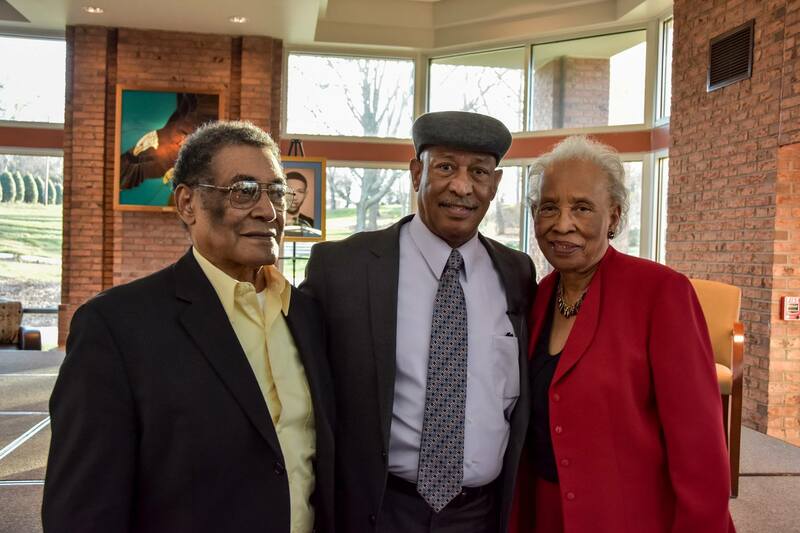 Mr. Jordan and his parents, who still live in Canton. 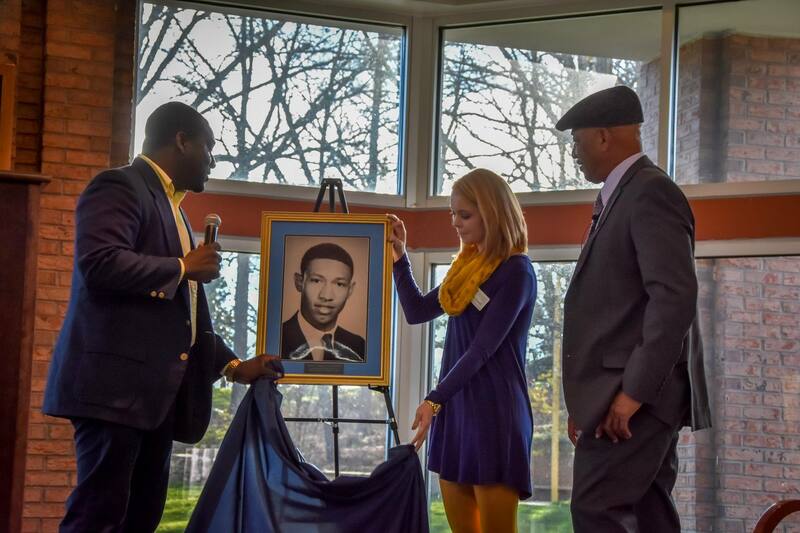 SGA President Jamie Palmer and Vice President of Student Activities Katie Purcell unveil a portrait of Mr. Jordan from the Reinhardt Cherokee Phoenix, which will be placed in the Lawson Academic Building. 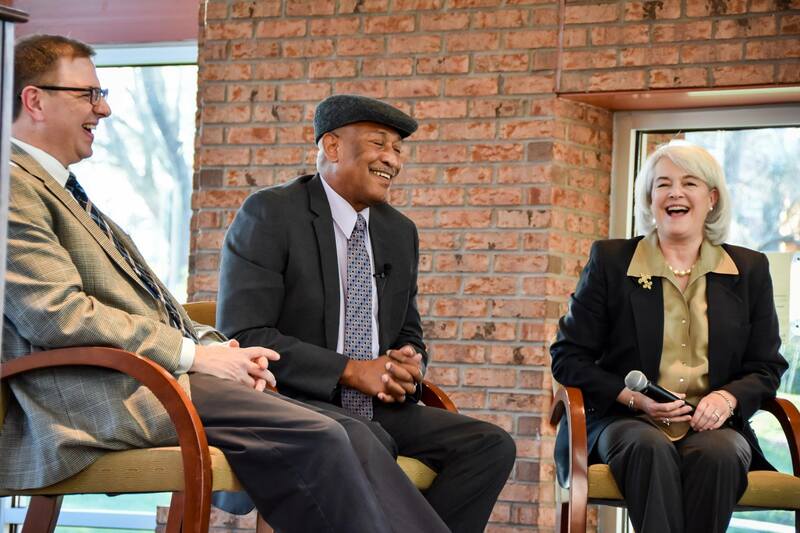 Thursday, Feb. 18, 3:30 p.m. to 5:00 p.m.
During this event, special guest James T. “Jay” Jordan, the first African-American student enrolled at Reinhardt, will discuss his life and experiences as a student when he entered Reinhardt in 1966. 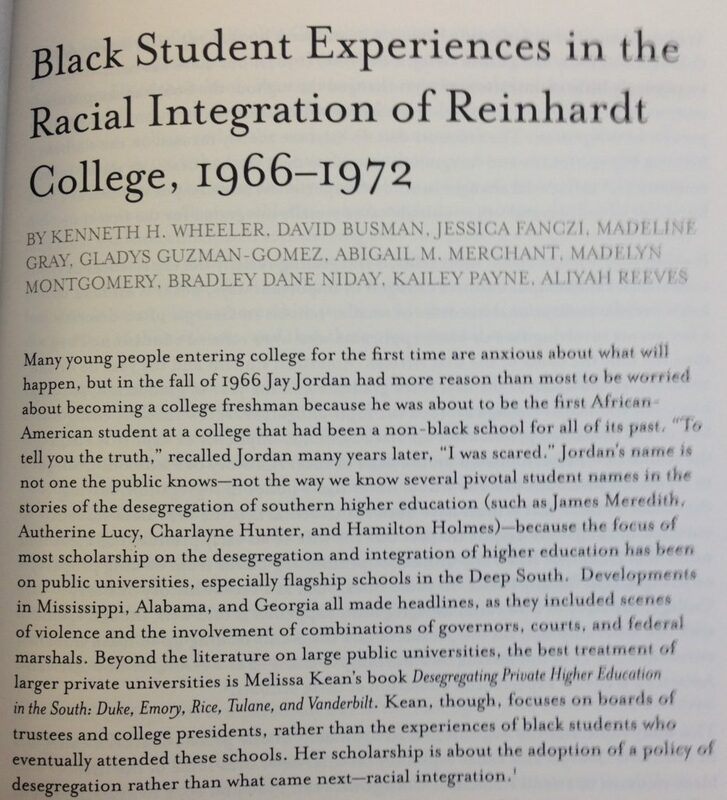 The symposium will be moderated by Reinhardt History Professor Dr. Kenneth Wheeler. In addition to recognizing James Jordan, there will be a lecture by historian Dr. Edith Riehm, who has studied President Truman’s Committee on Civil Rights and the post-World War II civil rights movement. Dr. Riehm will discuss the unheralded trailblazer role that Reinhardt alumna, Dorothy Rogers Tilly, Class of 1899, played in the Civil Rights Movement. Tilly devoted her entire adult life to reforming southern race relations. Her extensive career as an activist, organizer, and mentor forged a link between the reform efforts of the early twentieth century and the modern civil rights movement. She worked with the Women’s Missionary Society of the Methodist Church, the Commission on Interracial Cooperation, the Association of Southern Women for the Prevention of Lynching, the Southern Regional Council and the Fulton-DeKalb Commission on Interracial Cooperation, and the Fellowship of the Concerned (FOC). In 1946, President Harry S. Truman appointed Tilly to his Committee on Civil Rights. The Committee produced a famous and influential report, “To Secure These Rights,” which called for an immediate end to segregation. To the end of her life, through example and education, Tilly promoted racial tolerance and acceptance of desegregation during the explosive years of the civil rights movement. With the students bearing witness under the gray Georgia sky, Dorothy Nixon Williams rested her hand on a rough concrete headstone etched with the word “Father,” bent to touch the concrete slab beneath it, then wept in the arms of her son. 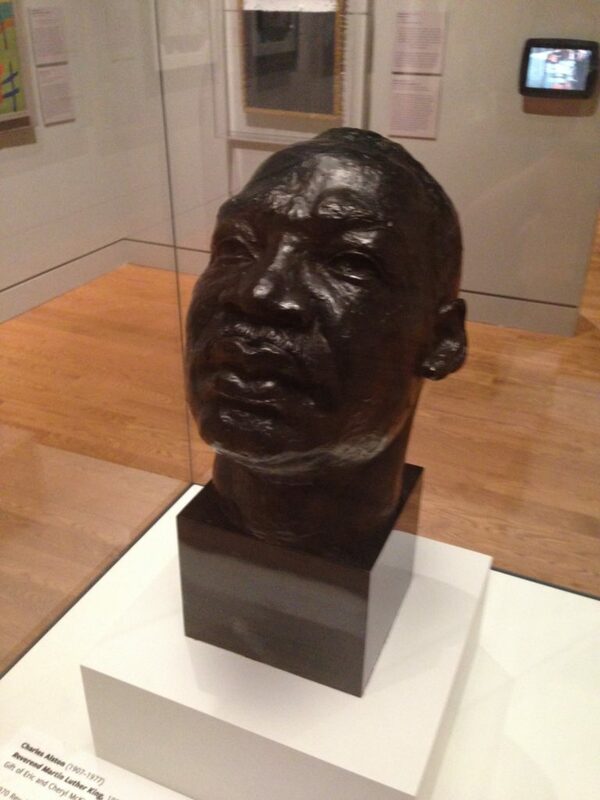 “Father.” Her father, Isaiah Nixon, an African American man who had dared to vote in the 1948 Democratic Primary in Montgomery County, Georgia, only the second held since the U.S. Supreme Court ruled all-white primaries unconstitutional. Her father, who was gunned down by two white men that evening on the front porch of her home, when she was just six years old. Her father, whose grave had been lost in the rural cemetery after Williams, her mother and five siblings fled to Jacksonville, Florida, shortly after his death. Her father, whose grave had been found by those Emory students. The gathering wasn’t a funeral, but their professor, Hank Klibanoff, offered a eulogy of sorts as Williams, her husband and son, the students and a few local residents — mostly relatives of others who had voted on that fateful day — stood together in the neatly kept graveyard ringed with pines. Much more at the link. A preview for readers of First Floor Tarpley: a short but significant article by Reinhardt history professor Ken Wheeler from the Fall, 2015 edition of Reinhardt Magazine, about Reinhardt alumna Dorothy Rogers Tilly. One joy of historical research is encountering the fascinating lives of people in other times. While researching a different topic, I serendipitously discovered Dorothy Rogers Tilly, a Reinhardt graduate who became Georgia’s most notable white woman working for racial equality during the 20th century. Decades before the modern civil rights movement, Dorothy Rogers Tilly, class of 1899, was an anti-lynching activist, leading boycotts and mobilizing churchwomen in campaigns for racial equality and social reform. As a member of President Harry Truman’s civil rights commission, she did important work. Tilly was one of several Rogers family members at Reinhardt. Her father, Richard, led Reinhardt as president from 1896 to 1901. A Methodist minister, he and his wife, Fannie, moved to Waleska with their many children in tow. One elder daughter, Lois, joined the faculty to teach English language, literature and history. Other Rogers children enrolled as students. President Rogers also pastored the local Methodist church. In the 1900 census, he indicated his occupation as “preacher.” It tells us something about him that being a college president was subsumed under his ministerial calling. In 1899, Dorothy graduated from Reinhardt with honors at age 16 and went to Wesleyan Female College in Macon, Ga., to complete her baccalaureate degree. Soon she married Milton Tilly, and a year later they had a son, Eben. A difficult pregnancy led doctors to recommend that she bear no more children. As a result, once Eben was beyond his early years, she was a well-educated woman with energy and time on her hands. She worked for the Women’s Missionary Society of the Methodist Church and in 1918 began running its Children’s Work for North Georgia program. This position carried her into contact with the poor, both black and white, and during the 1930s she expanded her engagement with social causes, joining first the Commission on Interracial Cooperation and later the Association of Souther Women for the Prevention of Lynching – she served as secretary, field reporter, and representative. Still, highly involved with Methodism, Tilly had also moved into civil rights. In the 1940s, she organized Georgia churchwomen in boycotts of businesses owned by Ku Klux Klan members and fought against poll taxes across the South. Because of work Tilly did in Washington, D.C. in the 1930s, she became friends with Eleanor Roosevelt. Roosevelt wrote in her memoirs that she admired Tilly’s courage because “I was told that whenever a lynching occurred, she went alone or with a friend, as soon as she heard of it, to investigate the circumstances.” Perhaps a recommendation from Mrs. Roosevelt led to the invitation in 1946 for Tilly to join President Truman’s Committee on Civil Rights. The committee produced a famous and influential report, “To Secure These Rights,” which called for an immediate end to segregation. Tilly and her work aroused opposition. The Klan threatened to bomb her home, and she received many harassing calls. Undaunted, she talked back to her callers, repeatedly asking them to identify themselves, but eventually she placed a record player by her telephone stand. When a caller coul dnot be engaged in reasonable conversation she dropped the needle on a recording of the Lord’s Prayer, which played into the phone’s mouthpiece as she walked away. 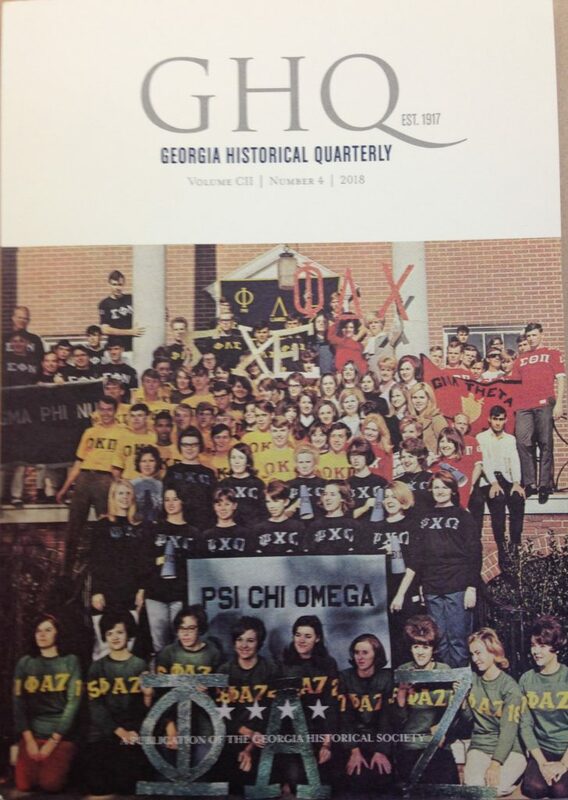 In 1949, Tilly founded a new organization in Georgia, one she ran almost single-handedly, called the Fellowship of the Concerned, FOC. The FOC, with thousands of members, launched various initiatives and hosted interracial conferences, foreseeing a future that many people could still scarcely imagine. Anticipating, and then reacting to, the 1954 Brown v. the Board of Education decision that declared public school segregation unconstitutional, the FOC trained women in how to make their white communities ready for integrated schools. The late 1950s and 1960s brought mass-action protest of a different sort to the fore in the search for racial equality and the civil rights; young activists often had little use for what seemed an older generation’s maternalism. Yet in 1963, the year Tilly turned 80, President John F. Kennedy appointed her to the National Women’s Committee for Civil Rights, and Tilly, ever vigorous, carried on with the FOC almost until her death in 1970. Overall, the life of Dorothy Rogers Tilly shows how she fused her family background, education and church involvement into a persistent commitment to tackle a massive social problem. Tilly connected Christian social work and social reform of the early twentieth century to the beginnings of the modern civil rights movement. She is a powerful example of the importance of women’s roles in changing social views, and her involvement in Methodist women’s groups was central to her ideas about how to bring dignity to and improve people’s lives. Reinhardt, led by Tilly’s father, clearly had an ethos supportive of that work of Christian uplift; while Tilly was an exceptional person, her life gives us clues about he kind of training and mentality that some Reinhardt graduates of that time carried with them as they left Waleska for the wider world. For more on Tilly, see chapters on her life in From the Old South to the New (1981), Throwing Off the Cloak of Privilege (2004), and Before Brown (2004), which is reprinted in Politics and Religion in the White South (2005).